Should you wake up to hole that wasn't there before!! Don't worry we can provide an emergency appointment if needed. Once our work is complete we will tidy up any mess made, lift all dust sheets, and provide you with a broken down invoice showing honest charges. All replaced parts will be left unless advised otherwise. For more on our Plumbing services available across Essex and London, please contact Clearwater Plumbing & Heating today. To Book a appointment below just select your preferred day and time slot. We will then approve your booking and send you a confirmation email. If you have any Queries then please contact the office on 01375 386529 or 0208 111 1236. 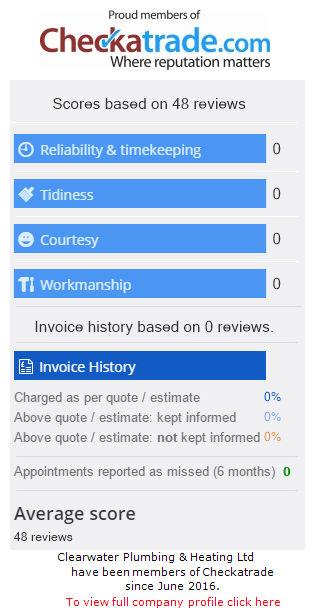 Please try our Online Boiler Quotation calculator, this is accurate to within 5% when connecting to the correct existing pipework. Once Completed you will be contacted by our office to make appointment or you can book your own appointment in the calendar to Left.